“Hello, Bolete (‘Bo-leet’), how can I help you?” Says the voice on the other end. At this point, my face lit up like a child who was just told they were going to Disneyworld. “Hi, do you have availability for two in the tavern at 6:30?” Asked Steven. To our surprise, there was availability on a Friday night. We arrived about 30 minutes later and the place looked exactly as we left it. The restaurant is set on the first floor of a Stagecoach Inn with the most comforting yet simple decor. We have been dining here since we discovered them in 2010 and I still dream about dinners here even though they are not as frequent as when we were at school. Tonight we sat in the tavern, next to the bar, at a cute little two person table by the window. The cocktail menu is constantly changing and this season they added two cocktails that were made with pickle brine. One is usually served with vodka and the other with gin, but I couldn’t resist trying both with the house rye. The first was rye (originally gin) with pickle brine, pickled veggies and cracked black pepper…OMG!!!! It was sooooo good. It had a little bit of a sweet endnote, but it all worked so well together (think pickle-backs). The second was a rye (originally vodka) with pickled mushrooms and pickling juice. Thanks to the mushrooms, this one had an earthy flavor. Also, this was my first time having a pickled mushroom. It was definitely very interesting and gave great body to the drink as a whole. This cocktail reminded me a lot like a dirty martini, so if you’re a fan of the dirty this is the drink for you! We started dinner with the chips and dip. The chips were super thin and seasoned with Parmesan and fresh herbs and served with a truffle aoli. The chips were so incredibly light and were not oily at all. The dip was also very light and worked great with the French fries we had as well. 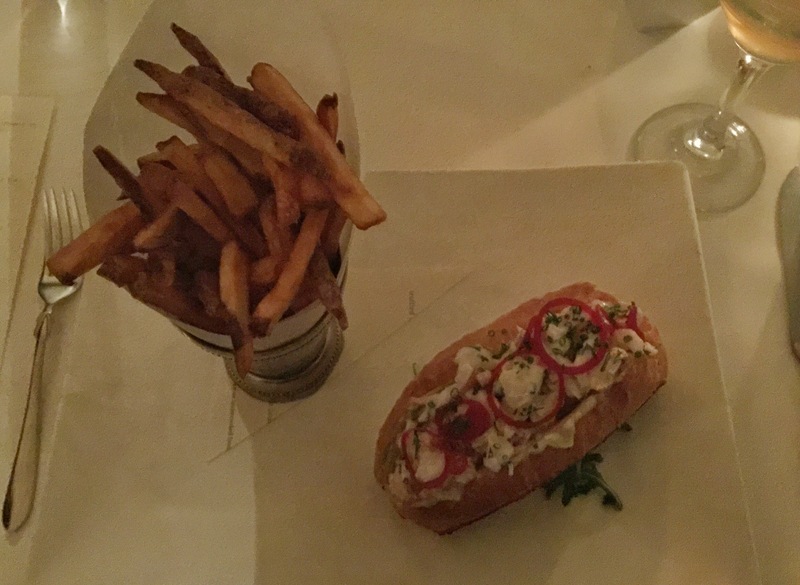 For our main course we shared the lobster roll and the burger. We ordered our burger rare, which is the only way we order burgers, and it was cooked to perfection. 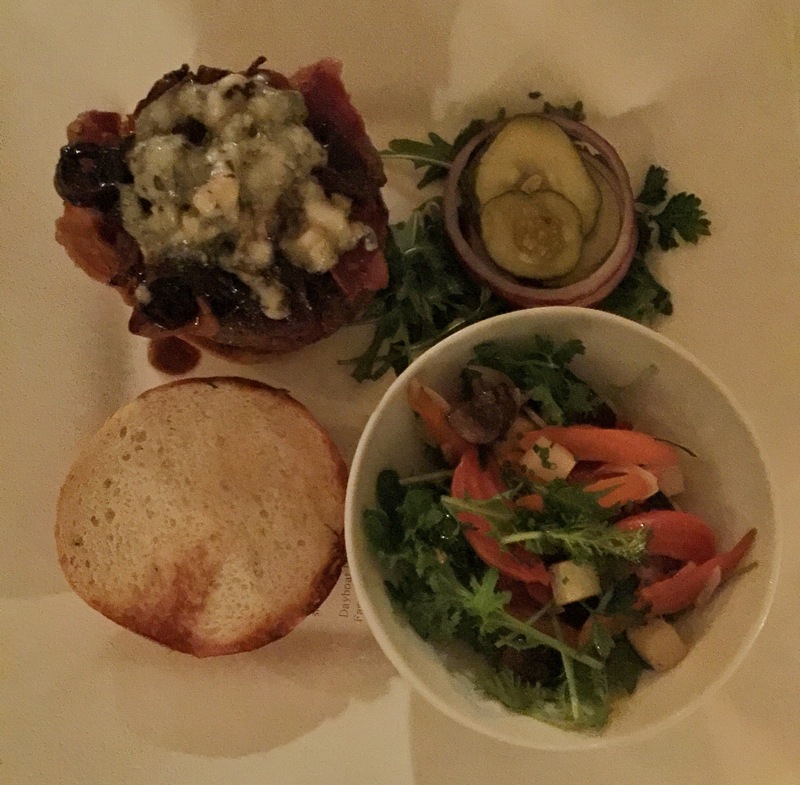 It was juicy and tender and worked so well with the toppings of house cured bacon, homemade mushroom marmalade, greens and blue cheese. The lobster roll was also divine!!! It was garnished with pickled shallots, which transformed it completely. We also had the fries and a side of sautéed veggies with our dinner. Being that Bolete is based on a local farm to table lifestyle, you can never go wrong with the sautéed veggies. Since we were in a bit of a rush to get to Pittsburgh, we skipped out on dessert, but this is definitely not recommended. Everything is always so incredibly delicious. Our other visits to Bolete have included many tasting menu dinners, birthday dinners and tavern dinners! There is nothing I would not recommend. The menu is constantly changing, but always exceptional. Definitely the best restaurant in the Lehigh area and highly recommended. Thank you so much to Erin and Chef Lee for always making our experience at Bolete unforgettable. We can’t wait to be back, hopefully sooner than two years again! !